To evaluate the impact of populist views on attitudes about the news media, the survey focused on measuring core components of populism. Academic studies of populism consistently identify a few key ideas as underlying the concept: (1) the people’s will is the main source of government legitimacy, (2) “the people” and “the elite” are two homogenous and antagonistic groups, and (3) “the people” are good, while “the elite” are corrupt (Stanley, 2011; Akkerman, Mudde, & Zaslove, 2014; Schulz et al. 2017). The measure of populism used in this survey is based on respondents’ answers to two questions: 1) ordinary people would do a better job/do no better solving the country’s problems than elected officials and 2) most elected officials care/don’t care what people like me think. Both measures are meant to capture the core ideas that the government should reflect the will of “the people” and that “elites” are an antagonistic group that is out of touch with the demands of “the people.” The second measure is a traditional question asked regularly over time on political surveys to measure efficacy and dissatisfaction with government responsiveness. This measure, or ones that are similar, are used by scholars studying populism to capture attitudes about an antagonistic relationship between elites and the people (Stanley, 2011; Spruyt et al. 2016; Schulz et al. 2017). These two questions were combined into a single variable with three categories: people who hold “populist,” “non-populist” and “mixed” views. Those who answered that elected officials don’t care about people like them and who say ordinary people would do a better job solving the country’s problems than elected officials are considered to hold populist views. People who say the reverse – that elected officials care and that ordinary people would do no better – are considered to hold non-populist views. Everyone else, including people who refuse to answer one or both questions, is considered to hold mixed views. Spearman correlations for the two questions measuring populism combined fall between 0.2 and 0.3 across the eight countries. The attitudinal differences between those who hold populist views and those who do not based on the combined measure also occur when using either one of the two measures on its own. However, the attitudinal differences are larger and more consistent when using the combined measure. The advantage of focusing on these core components of populism, rather than additional concepts, is that these core components cut across populist movements on the left and the right of the ideological spectrum. By having a measure that is not constrained by left-right ideology, the survey provides a consistent, cross-national measure of fundamental tenets of populism. One way to validate a measure of a concept is to evaluate whether it correlates or predicts attitudes on other topics one might expect it to be related to. One key attitude on the survey that any measure of populism should be related to is views about political parties in the country. People who hold populist beliefs are expected to have more positive views than non-populists about non-traditional or anti-establishment parties, sometimes referred to as populist parties. Indeed, the survey shows that populists and non-populists often differ widely in their opinions of anti-establishment parties. 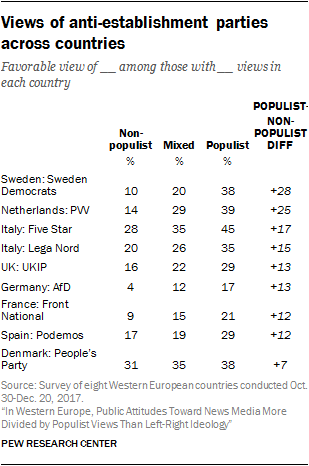 For example, Swedes who endorse populist views are 28 percentage points more likely than non-populists to have a favorable view of the Sweden Democrats. 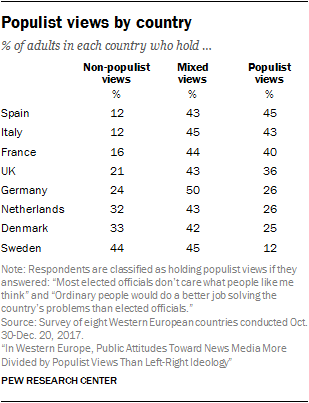 In Spain, 29% of populists have a favorable view of Podemos, compared with 17% of non-populists. The measure used in this report for populist views helps predict higher levels of support for both right- and left-wing populist parties.